(Image: Clearbridge Mobile Inc., Tim Hortons). Screenshot of the TimmyMe app for BlackBerry 10. The next time you grab that double-double at your neighbourhood Tim Hortons, you might not have to bring your wallet – your smartphone could be all you need to pay for your caffeine fix. Last week, the coffee giant announced it was rolling out updates to its TimmyMe app for BlackBerry 10, Google Android, and Apple iOS, now allowing customers to pay for their orders using their smartphones. After registering a Tim Hortons card with the app, customers can either tap to pay with a NFC-enabled BlackBerry 10 device, or their orders can be scanned using barcode scanning technology for Apple iPhones running iOS 6.0 or later, or Android 4.0 or later. 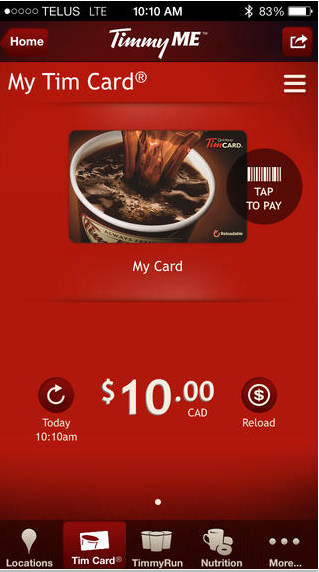 While Tim Hortons released the TimmyMe app back in 2011, the update marks its first foray into the mobile payments space, joining a slew of other retailers who have been accepting payment by smartphone. For a coffee shop trying to move customers quickly through lineups and process orders more efficiently, it seems like a natural move – Starbucks Corp. was one of the first coffee retailers to start offering mobile payments back in 2011. Still, adding the ability to pay with a mobile device wasn’t necessarily simple – the developers behind the app had to put a fair amount of thought into their designs. IBM Corp., which developed the TimmyMe apps for Apple iOS and Android, had been working on the project for the last six months. It also added other functionalities, like allowing users to manage their Tim cards and add funds, says Alon Kronenberg, mobile solutions lead at IBM. 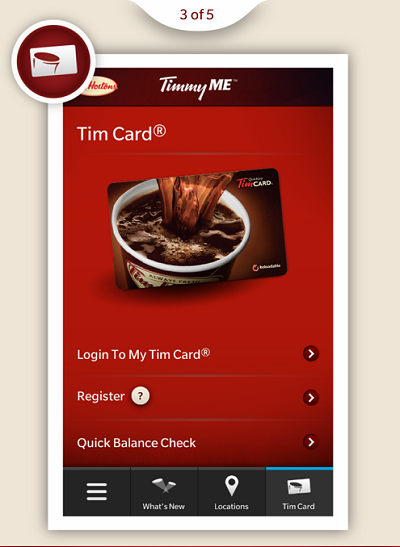 “When we designed our mobile app for Tim Hortons, there’s always two things you’re trying to accomplish. One is, you want to make sure your application is as natural an experience on the device that’s being used as possible,” he says. One of the challenges was coming up with a design that would work for various types of Android phones, since the app had to fit for devices with different resolutions and screen sizes, Kronenberg says. That meant the team had to do a lot of testing, and team members also had to plan ahead about how they were going to map out their designs. (Image: Google Play, Tim Hortons). Screenshot of the TimmyMe app for Android. For example, instead of using pixel positioning, the team opted to use relative positioning to ensure its graphics weren’t stretched out on the screens of larger devices, he says. However, the biggest challenge for the developers was figuring out how they were going to make it possible to scan the barcodes on the apps at the cash register, bringing a host of design decisions into play. For example, they decided to adjust the dimming of the light on the smartphones when the barcodes were presented. Setting the brightness at the highest level makes a barcode easier to scan, Kronenberg says. (Image: Apple App Store on iTunes, Tim Hortons). Screenshot of the TimmyMe app on iOS. For Toronto-based Clearbridge Mobile Inc., the company that developed the TimmyMe App for BlackBerry 10, the team was also focused on creating a good mobile experience, says Sanjay Malhotra, Clearbridge’s CTO. The developers’ main challenge was to make it easy for Tim Hortons’ customers to use the tap-to-pay functionality, which is powered by near field communication (NFC) technology. “The first thing we did was to redesign the flow of the application, so if you compare it to the iOS and Android versions, this app is simpler to use, especially with one click to pay,” he says. (Image: BlackBerry World, Clearbridge Mobile). Clearbridge’s developers also gave a lot of thought to how the application was going to be used. Beyond encrypting and securing transactions, they also focused on ensuring people using the app could get in and out of the Tim Hortons lineups quickly. “We didn’t want people fumbling in the app to find how to pay. We wanted to streamline that process,” Malhotra says, adding the team also created a tutorial to show its users exactly how the app works. While Tim Hortons isn’t the first retailer to give its customers the chance to pay using mobile devices, Kronenberg doesn’t believe it’ll be the last. He says he believes mobile payments are on a “significant uptick,” though it may take a while for banks, telecommunications companies, and retailers to figure out how to deliver them. “We’re starting to see some signals that it’s happening,” he says, noting CIBC and Rogers announced they were launching a mobile wallet back in November 2012. 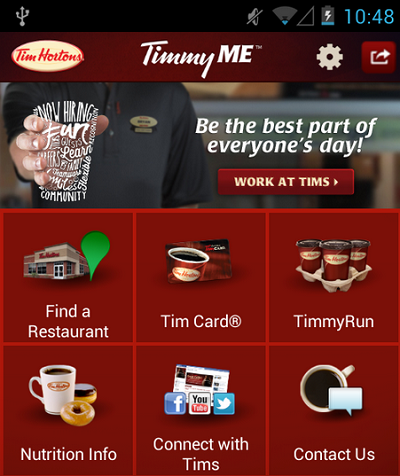 The iOS and Android versions of TimmyMe are currently available in pilot mode at select Tim Hortons locations in southern Ontario, while the BlackBerry 10 version can be used at any participating location in Canada. Downloading the app is free on all platforms.